Polycom VVX 601 IP Phone | 8x8, Inc. 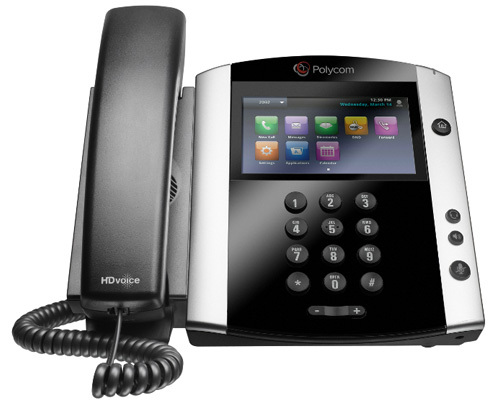 The Polycom VVX 601 IP is the-top-of-the-line flagship phone in the new class of IP desk phones with extraordinary technology innovation. The Polycom VVX 601 is an exceptional choice for executives and senior managers, busy multitasking professionals, or even receptionists or group admins who perform high volume multi-call management and require the ultimate in quick and responsive call handling. The VVX 601 also comes with a built-in Gigabit Ethernet bridge to connect a high speed device to your phone. 16 line keys – Use the standard 2 line keys for managing two live calls on your phone at the same time, and use the others as speed dial keys, or add-on Power Keys Service to manage up to 6 live calls at a time and/or monitor the call status of up to 14 other extensions — all without the need for a sidecar. VVX Sidecars to add additional line keys are also available soon. Power Keys — Take advantage of any unused line keys on your Polycom phone and transform these line keys into a powerful call handling and workgroup monitoring tool. The Power Keys Service is an optional service that allows you to assign BLF (Presence) keys and line appearance keys to transform your phone into a powerful workhorse.